Lee Angol is expected to start up front for Posh at Oldham. Photo: Joe Dent/theposh.com. Peterborough United’s trip to Oldham in League One tomorrow (January 24, 7.45pm kick off) is the most improtant game of the season according to manager Grant McCann. 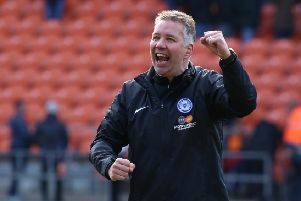 It’s the game Posh have up their sleeve on many of their promotion rivals, A point would take Posh up a place to seventh while a win would move McCann’s men to within a point of the play-off places. On-loan centre-back Dominic Ball should be in the Posh starting line-up against Oldham. Photo: Joe Dent/theposh.com. And McCann is confident a large home crowd taking advantage of an offer of free admission will actually boost his side. Oldham are expecting 8,000 to turn up at Boundary Park - more than double the number the relegation-haunted Latics normally attract. Posh beat local rivals Northampton twice and won at Saturday’s visitors (January 28) MK Dons in front of relatively large crowds this term. “We’ve done well in front of big crowds this season,” McCann stated. “We will enjoy the fact Oldham will have lots of fans. It’s a great gesture by them to let all fans in free and they deserve a packed house. “But we all prefer to play in front of big crowds who generate a good atmosphere so we’re looking forward to the chance to show them what we can do. Posh centre-back Jack Baldwin is back in training. “To me, it’s the most important match of the season so far. It’s a game in hand and if we win it we will be right in touch again with the top six. “That’s our focus, but it was a difficult game for us even before Oldham guaranteed themselves a big crowd. No-one has any given right to win any football match. Look how hard we found it was to beat Chesham in the FA Cup. “Oldham have John Sheridan back in charge and he worked wonders for them last season. We played against his Notts County team twice already this season and they gave us two hard games. “Oldham will be organised and they will be aggressive so we will have to be as resolute as we were against Swindon on Saturday (January 21). We didn’t deliver a classic performance there, but we dug deep to get the result we wanted (Posh won 1-0). “We travel in good form. We’ve won seven and drawn three of our last 13 League One games. It could be a better record, but it could also be a lot worse. McCann is expected to name an unchanged starting line-up and there was good news on the injury front today as central defender Jack Baldwin returned to training following his latest knee operation. Baldwin should be pushing for a starting place in a fortnight.